Oxfam Trailwalker Perth participants cross the finish line at Forrestfield (Sharon Smith/OxfamAU). THE last superstar walkers from the Oxfam Trailwalker Perth event crossed the finish line at 3.20 on Sunday morning, October 7, at Forrestfield, wrapping up another spectacular Oxfam Trailwalker weekend. 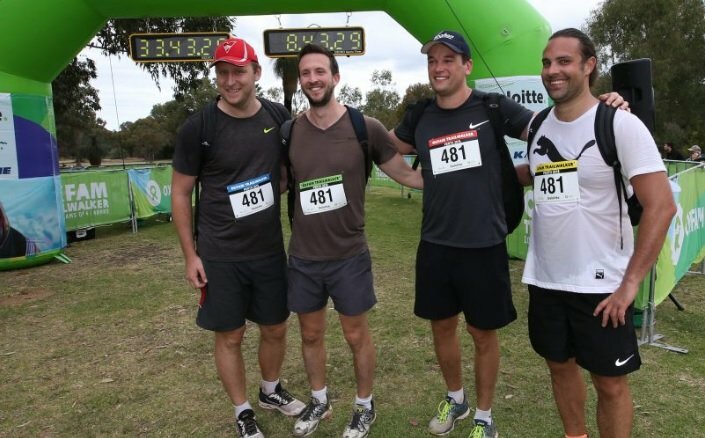 More than 600 participants trekked through the gorgeous Perth Hills from Friday to Sunday, raising more than $450,000 for Oxfam’s work tackling poverty in communities around the world. Oxfam Trailwalker is a fundraising endurance challenge where teams of four have 48 hours to walk 100km, or 24 hours for those doing the 50km event. The 100km trail started on Friday morning at Darlington and the 50km trail started 24 hours later at Chidlow. Both events then followed the same trail, finishing up at Federation Gardens in Forrestfield. The first team to cross the finish line on Friday night was a group of AFL umpires called AFL Boundary, who ran the 100km trail in an incredible 14 hours. The oldest participant in Perth this year was 76-year-old Roy Barton, who flew over from England to walk the 100km trail with his daughter Emma, grandson Adam and friend John. Their team, 3 Gen Plus 1, made impressive time and were the sixth team to cross the finish line. “I’ve been training since this time last year,” Mr Barton said. Team Have a Chat were one of the highest fundraisers this year, raising more than $10,000 for Oxfam’s lifesaving work. Team leader Peter Best has worked in refugee camps in Africa for 13 years so the cause is very close to his heart. “It makes me recognise how really, really fortunate we are in Australia. We’re wealthy in ways we’re not even conscious of – in space, in safety, in food, in health, in education. We’re so well off. And here’s a chance to share with other people the opportunity to help someone else who’s not so fortunate,” Mr Best said. Oxfam spokesperson Anna Wemyss said the event had been a success and she was grateful for the more than 400 volunteers who generously donated their time over the weekend. “We’re so grateful for the fundraising efforts of our teams and of course to our hundreds of lovely volunteers. Without them Trailwalker just couldn’t run,” Ms Wemyss said. Oxfam Trailwalker has raised $100 million nation-wide since first launching in 1999. The generous participants of Perth have raised $6.5 million since the event started here in 2013.